We have exciting news to share with you! After many months of planning, undergoing a lengthy State review process, coordinating with the City of San Mateo on their adjacent Fire House project, dealing with the rising costs of construction in the Bay Area which have affected our project, we are now poised to award the excavation, grading and underground utilities bid for the Borel project. The lowest, most responsive and responsible bidder for this phase of the work has a solid reputation for timely and professional work. Of equal importance, the bid is close to the revised budget approved by the Board of Trustees last June after a second independent cost estimate was done. The award of bid is on the District’s Board of Trustees’ agenda for February 21. The succeeding weeks will be spent on finalizing contract documents, securing performance bonds and managing all the details needed to put the first shovel in the ground in late March/early April. 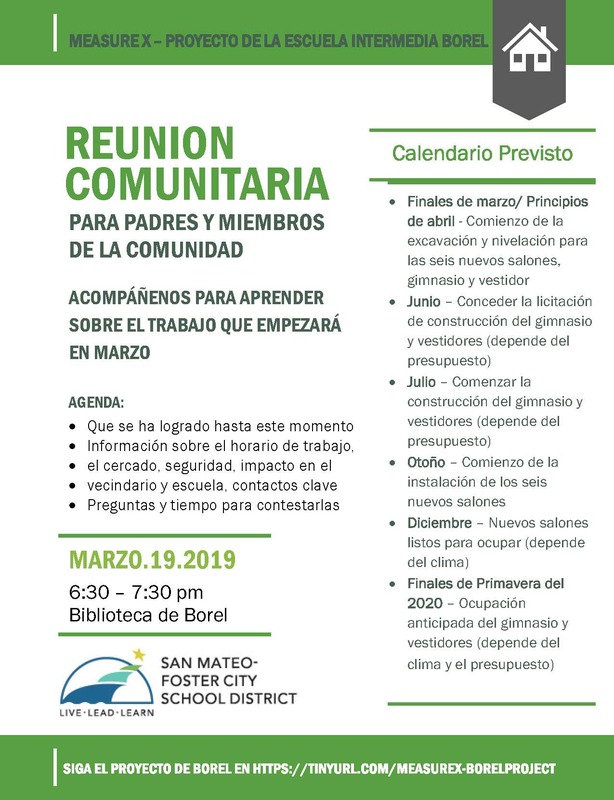 I invite you to attend the Community Meeting planned for Tuesday, March 19 at 6:30 pm in the Borel Library. 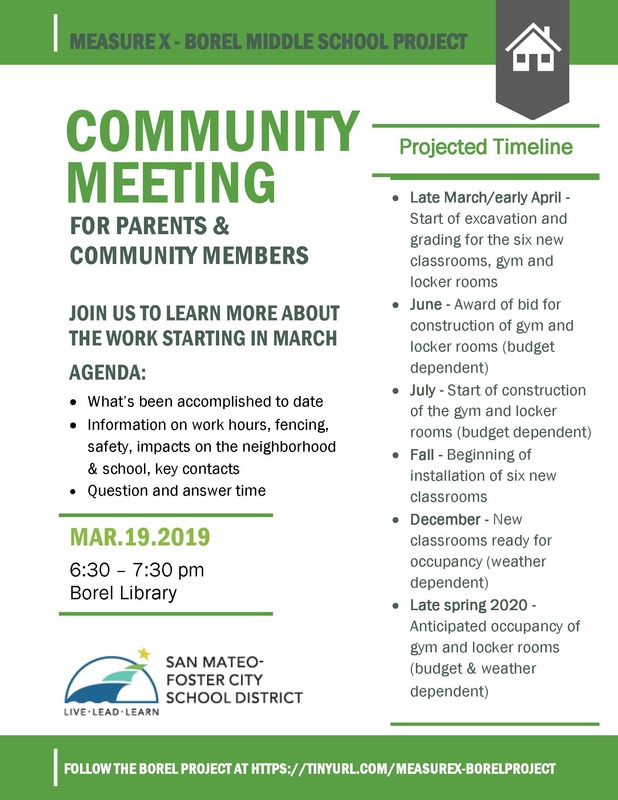 The meeting will include a project update; renderings; plans during the excavation/grading such as hours of work, contractor parking, contractor contact information, construction fencing; and impact on the neighborhood and on school operations such as physical education classes, noontime activities, and evacuation plans. The Community Meeting also will include an opportunity to ask questions. 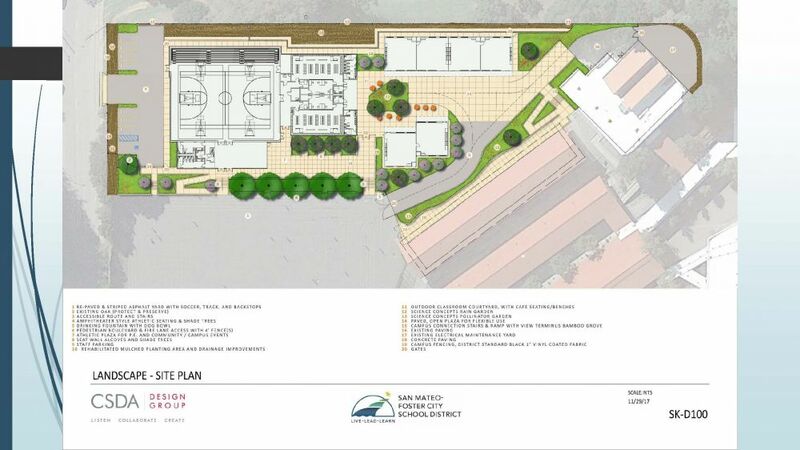 Photos of work in progress will be posted later this spring after excavation and grading begin. Thank you for your support on this journey to provide needed facilities for Borel’s students.